NATO bases occupy more than one third of Sardinia’s land and sea territory. During military drills and naval exercises, the sea surrounding Sardinia is closed to navigation and fishing, thus increasing the NATO control beyond the land boundaries to encompass around 7,200 square miles. The island of Sardinia is home to two completely different worlds. On the one side sits the villas of the super-rich, with coastal mansions valued in the hundreds of millions. Yet on the other sits Europe’s largest military exercise ground, where amour piercing uranium-tipped missiles were tested by the thousand. Now, a disproportionate number of cancers and children and livestock born with hideous deformities have led to accusations of a cover up as to the extent of NATO’s polluting of the island. 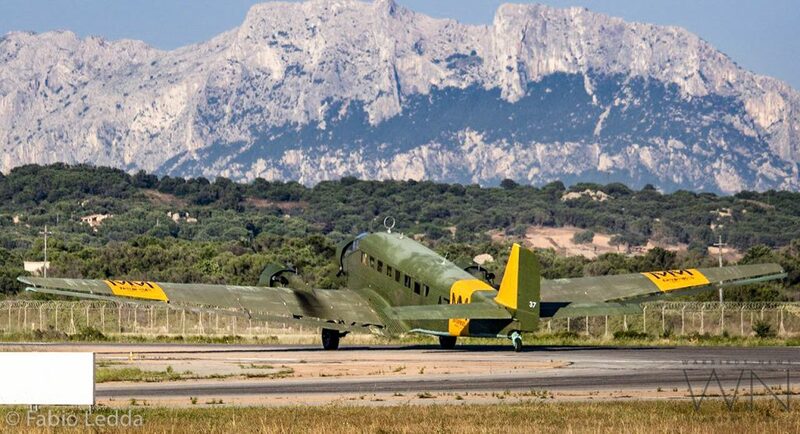 It is a military airport located northwest of the city of Cagliari, Sardinia, in a vast area between the towns of Decimomannu, Decimoputzu, San Sperate and Villasor. The airport is named after Colonel pilot Giovanni Farina, Gold Medal for bravery, died in combat in the skies of Sardinia 14 June 1942. The airfield is a front-line NATO training facility primarily used since 1979 for Dissimilar Air Combat Training (DACT) of various NATO air force fighter aircraft. Decimonannu is also the Home Base for the Taktisches Ausbildungskommando der Luftwaffe Italien and the Base is used for Training flights. Post WWII, NATO gradually invaded Sardinia. Military bases sprang up across the island. These include Decimomannu air base and Salto di Quirra, the biggest scientific miltary base in Europe. 60% of all Italian, NATO and non-NATO military installations are based in Sardinia on this stretch of land 24,000 square kilometres, a piece of land one tenth the size of the Italian mainland. 35,000 hectares are being used for “experimental” weapons testing. Sixteen NATO military bases have marred the devastatingly beautiful landscape of Sardinia. A document leaked in 2003 revealed that the Italian government is raking in $ 63,000 per hour in rent for the land in Sardinia being used for experimental weapons testing and clandestine military exercises. Militaries and arms manufacturers have used Sardinia to test new bullets [including DU, depleted uranium], bombs, missiles and drones. It is a training base for navy and airforces. It is the scene of military exercises, drills and war “games”. Old weapons, explosives and missiles are also exploded, burned and buried – ensuring pollution of air, land and water sources. It is also a hop-off point to North Africa. Bombing sorties into Libya, for example, have been launched from the island. In 2011, local public prosecutor, Domenico Fiordalsi led a campaign to investigate the NATO contamination and its deadly consequences. Fiordalsi sought to exhume the corpses of local shepherds who had died of various mutations of cancer and abnormal diseases in order to prove a correlation between these high incidences of unusual deaths and the increased weapons testing activity on the island. Helen Jaccard of War is a Crime compiled a detailed report of the various forms of contamination on Sardinia in her 2012 report. • Thorium, a radioactive and highly carcinogenic heavy metal used in military targeting systems has been found in Sardinian honey, milk, and other areas of the food chain. • Unexploded ordnance lies in and around the restricted areas, including both land and sea. The occupation dates back to the 1954 Bilateral Infrastructure Agreement, signed by Interior Minister Scelba and US Ambassador Luce, but which was never ratified by the Italian Parliament. The agreement allowed US occupation of Italian, and particularly, Sardinian land, with the establishment of many military bases where some of the world’s biggest armies undertake training. These include the US, Israel, France and Germany. Much of Sardinia has been transformed into a real scenario di guerra, with on-going exercises carrying out bombings and missile shootings. The landscape is littered with abandoned tanks, missile shells and craters, as well as traces of radioactive elements which have had shocking environmental and health impact on local populations. In 1988, in the town of Escalaplano, 25 per cent of all children were born malformed or with serious illnesses. Extraordinarily high rates of leukaemia are recorded in this area. With the help of scientific and medical experts, including renowned scientist Dr Antonietta Gatti, Camillo presents numerous cases which can be linked to the radioactive element thorium, which has been discovered in bodies of the deceased, and in deformed animals. NATO has been previously linked to depleted uranium usage, in the 1999 bombing of Yugoslavia which has lead to hugely increased cancer rates in central parts of Serbia. Secret Sardinia: The island of Sardinia is home to two completely different worlds. On the one side sits the villas of the super-rich, with coastal mansions valued in the hundreds of millions. Yet on the other sits Europe’s largest military exercise ground, where amour piercing uranium-tipped missiles were tested by the thousand. Now, a disproportionate number of cancers and children and livestock born with hideous deformities have led to accusations of a cover up as to the extent of NATO’s polluting of the island.